This story was updated on July 27 at 9:16 EDT. The U.S. military is moving along with plans to recycle space junk into new, working satellites. Several engineering companies announced new agreements with the Defense Advanced Research Projects Agency yesterday (July 25). The deals offer a glimpse into the technology to be incorporated into the final project. DARPA is researching how to harvest working antenna, solar arrays and other parts from otherwise broken satellites that are still in geosynchronous orbit, about 22,000 miles (35,406 kilometers) above Earth. 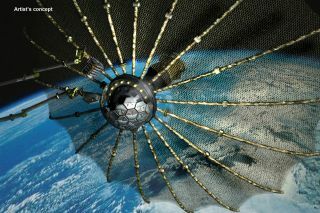 The military agency wants to build satellite "mechanics" that can go into space, remove working parts from non-working communications satellites, and then transfer the parts onto new, very small satellite base structures that DARPA calls "satlets." Such in-space recycling would lower the cost of building new satellites and other space projects, DARPA officials say. In addition to saving money on materials, the satlets could hitch a ride into orbit on other spacecraft, so they would be cheaper to launch than fully equipped satellites. The military is interested in recycling satellites because it wants to maintain 24-hours-a-day communication across the globe, according to the website of the recycling project, called Phoenix. For DARPA's plan to work, it needs end effectors — robotic arms and hands — to help the mechanic-like servicing satellites to dock with other satellites and manipulate them. In its new agreement with DARPA, New York City-based Honeybee Robotics will create prototypes of two different end effectors for the mechanic satellites. Software to control the robotic arms will come from Energid Technologies of Cambridge, Mass. "The Phoenix program is an important step towards on-orbit satellite servicing, which has great potential to extend capabilities and satellite lifespan in an affordable way," Jason Herman, Honeybee's director of robotics, said in a statement. "We're proud to support a program this significant to the Department of Defense and the space sector as a whole." Meanwhile, ATK, an aerospace, defense and commercial products company headquartered in Virginia, and the University of Maryland will develop robotic tools for fixing satellites, as well as software to get a transplanted antenna to work on a new satellite base. ATK is also building a spacecraft bus, or basic model, that can go on rendezvous missions for at least a year. The Naval Research Laboratory will receive the bus, ready for testing, by October 2014, ATK said. "ATK is proving itself as a market leader in the satellite servicing business," ATK Space Systems Division vice president and general manager Tom Wilson said in a statement. "Our existing expertise in spacecraft bus technology and robotic satellite servicing tools is a significant asset towards helping the DARPA Phoenix program achieve mission success."